The islanders in Vanuatu construct tall wooden towers, up to 100 feet tall. The tower has long vines hanging from different heights. As a part of a ritual, men will jump from this tower. This act of land diving serves as a passage into manhood for the boys on the island. Boys as young as five years old begin tying vines to their ankles and hurl themselves head first towards the ground. The further up the boys jump, the more masculine they are considered. This ritual shows strength, bravery, and faith—all qualities that the people value in their men. Through this ritual, the islanders are able to determine when a boy becomes a man—but what about for us? There is a trend amongst young men in the United States referred to as “delayed adolescence” or “emerging adulthood”—the former being used as the primary, and arguably more accurate, term. This reference is to name the whole generation of young adult men who are extending their period of freedom and self-pursuits for years beyond what has been traditionally typical. An example of this is that currently, 58% of men in their 20s are married, while thirty years ago that percentage was 85%. 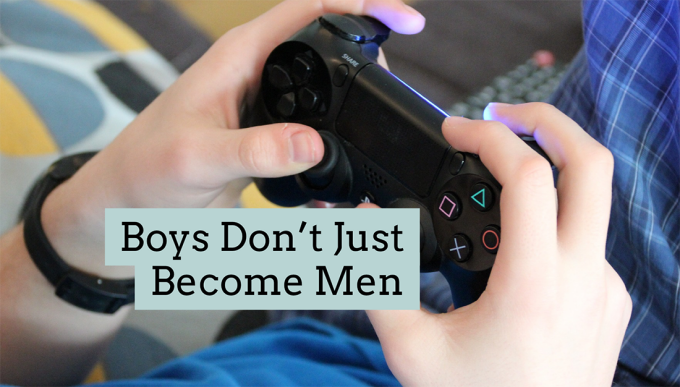 Adult aged males, are living more like boys than men, pursuing video games and part-time jobs over careers and families. Our current culture has many potential men struggling to find meaningful purpose. Christ-followers should seek to raise our boys into men who are successfully pursuing biblical purpose. A Christian man should be defined by his pursuit in following Christ, his sacrificial love for others, and his desire to work. Pursuing Christ: While this applies to all of mankind, it still carries high importance that, if men are to be the spiritual leader of their homes, that they are an active believer, pursuing Christ as they lead others to Christ. Matthew 22 states our greatest commandments, and as a creature made in God’s image, man cannot fully fulfill his purpose outside of following God. If we want the Church to raise godly men, it is necessary that they are guided in pursuing God. Sacrificial Love: Everyone loves a story where the hero risks everything for someone else; and we often want to be that hero! The concept of sacrificial love was exemplified in the love that Christ demonstrated on the cross and is then to be emulated by his followers. If a man is living for himself above all, he is missing his purpose. Men are blessed to be given the roles and titles of husband, father, brother, son, etc... Each of those roles presents an opportunity for a man to love someone more than himself, and in doing so, show a Christ-like love to others. Boys must be shown what this looks like by watching the other godly men in their lives. Work: Men were instructed to work from the very beginning, in the Garden of Eden. People are to work for the purpose of a myriad of things being accomplished. It is important that a work ethic is instilled in boys for them to see the value as men. While it may be easier to pick up a boy’s clothes, eventually there comes a point where a young man needs to know where clean clothes come from! Work is not a punishment but a necessity of life and it is important to help boys understand the importance of work and its role in a balanced life. Also, perhaps in a more important light, we are called to work for God. The purpose that many of the young men in America are missing can be found in a life that glorifies God through the work he has set for us to do! Churches are hungry for young men to invest their time and talents into the Kingdom. The goal is not a generation of workaholics—but rather a mindset that recognizes that work is a good thing for providing needs and for glorifying God. The issue of delayed adolescence within young Christians is not solved through complaining about millennials--or through a three-point list within an 835-word blog. A boy does not become a man when he reaches a certain age, achieves a particular accolade, or reaches a certain life stage. A boy becomes a man when they begin to live for God and others, in a way that fulfills their God-given purpose. If we want godly men, we need to invest in the young men around us through instruction, guidance, and being an example. I encourage you to invest in our young men with your prayers, your example, and your time.